Is the Eskimo curlew extinct? This is a hub about the search for Eskimo curlews (Numenius borealis) a bird that may or may not be extinct. The plight of the Eskimo curlews became well known through the book "Last of the Curlews" by Fred Bodsworth and the ABC After School Special of the same name. I will give a brief history of the Eskimo curlew, latest sightings (that I have available), and differences between this bird and other, very similar looking birds. I will also bring up reasons why this bird may be so hard to find (assuming it's not extinct) and why so many sightings go unconfirmed and not accepted. The reason why I am bringing this topic up (other than I just read the "Last of the Curlews" book and seen the special) is that the USFW and the Canadian government is about to close the coffin-lid on this bird. There hasn't been any physical proof of its existence since 1963 when one was shot in the shooting swamps of Barbados. Confirmed sightings have pretty much stopped since the 80s and 90s, though unconfirmed sightings have continued. In recent years, those sightings after 1963 have been dismissed as there was no physical evidence. **Hi everyone. So far in 2016, I still haven't heard of anything credible for at least a couple of years. The last sighting I've heard of was one in Barbados a couple years ago and it was very vague and could have easily been a whimbrel. I think now that the bird has been officially declared extinct throughout North America, people have given up even trying to look. I will still try to update people if I hear of anything that sounds interesting. The intro image for this page was supplied by a contribution to Wikimedia Commons by Daderot. 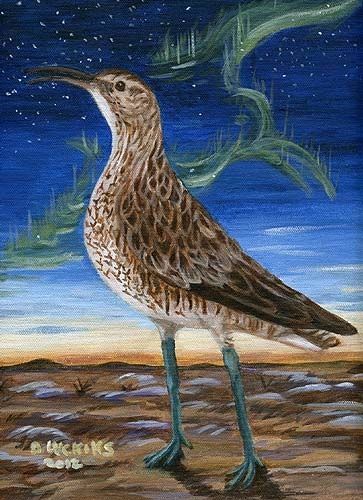 This is NOT a photograph, but an actual painting of an Eskimo curlew done by Nachiii on Deviant Art. (Pretty awesome, right?) She sells prints of this item (click on the link below to see the actual page). I bought one and it's hanging on my wall right now. This painting was posted with permission. There have only been five photographs of this species ever taken, originally in black and white by two different photographers. The very first photo ever taken of this bird has disappeared. Two of the other photos, taken later, were said to have had color added to them later on. More information about them is posted below. *Please do not link this image to this page on Pinterest. Visit the artist's original page for linking information and permission. This is (or was) a bird that had one of the longest migrations on Earth. It was said that this one one of the birds described by Christopher Columbus when he first spotted North America. It bred in the northern tundra areas of Canada and possibly Alaska and traveled all the way to southern Argentina and back. They are said to have been the most common shorebird in North America with billions of birds. After the civil war, during the great uncontrolled market hunts of the late 1800s, the bird was slaughtered to the point where only a few birds were seen each year and never recovered. Their primary spring food source, the Rocky Mountain grasshopper also became extinct around the same time. However, the bird seemed to still struggle on. It may also been mentioned in the Little House on the Prairie books (or, could have been a long-billed curlew, the books don't make a distinction. It could have meant both species). Drawing supplied by Wikimedia Commons. Henry Eeles Dresser is the artist. This is a story, written in the 1950s of a lone male Eskimo curlews in search of a mate. 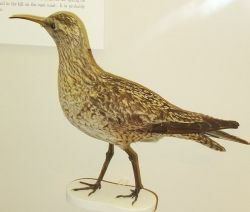 At this time, Eskimo curlews were few and far between and it was thought that they may have had trouble finding mates. In between the chapters, there are short descriptions of what it was like to watch these birds as they disappear in the form of a fake scholarly journal or newspaper. Be aware, this book has some very sad parts. This book gives you a good idea of what was going on with Eskimo curlews at the time it was written. The same thing may still be going on with them today. It highlights man's destruction of the natural world and the animals that try to overcome despite what has been done to them. The Last Curlew Calls to his Ancestors - Inspired by the book "Last of the Curlews". I did this painting after reading the book by Fred Bodsworth. I sure hope that there wasn't a last curlew out there. I have been trying to track down and keep a list of sightings (confirmed or unconfirmed) since about 1900, but I know this list won't be comprehensive. As I find more credible sightings, I will list them. I may be a little fuzzy about the dates and/or locations and will correct those when I find my error. If you know of any sightings, please report them to me in the comments section below and I will check them out. 1915--Though the birds have been seen off and on, this sighting of 5 birds in the Labrador area is significant because 4 of the 5 were shot. 1945--A pair of curlews in Texas. 1955--A "flock" in the Northwest Territories in Canada. 1961--1 in NWT (Northwest territories) and 1 in Texas. The Texas Eskimo curlew was photographed amongst whimbrels and was said to be good for size comparison. However, this very first photo of the bird has somehow disappeared. 1982--1 in Saskatchewan, Canada, and 1 in NWT. One of the sightings might have been a nest that was similar-looking to a whimbrel's nest. 2012--1 spotted in Barbados by very experienced shorebird and whimbrel hunters, possibly including a relative of the man who shot the one in 1963. However, juvenile whimbrel or long-billed curlew cannot be ruled out. Why is it so difficult to find this bird? 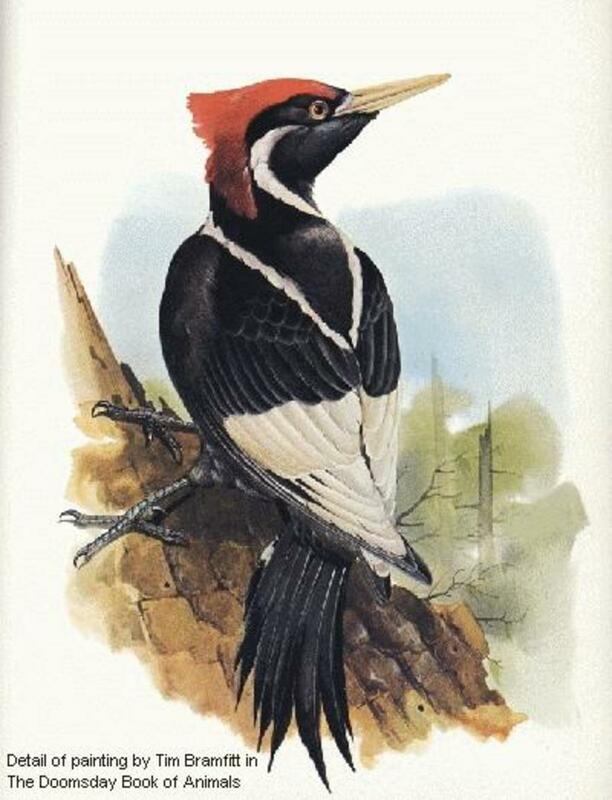 Some may wonder, why is it so hard to find (or not find) this bird and getting the sighting confirmed (assuming it's not extinct)? Well, there are many reasons. For one, this bird has an incredibly long and wide migration route. It can literally be anywhere in the western hemisphere except west of the Rocky Mountains and the heart of the Amazon. And, let's say there's only about 50 birds left, but only traveling in groups of 4 our 5. That's like looking for the proverbial needle in the haystack. Once, in another forum, someone suggested that the surviving populations may have managed to find a way to migrate over most of the Great Plains without stopping. Another reason is that the bird breeds and winters in extremely remote locations that can't be reached by foot or boat. They live and breed where the ground is very soft and mucky, far away from any human settlements. Another big reason is that the bird looks extremely similar to it's larger cousin, the whimbrel, whom it often associates itself with. Agencies say that many hunters report seeing this bird, but when shown a photo of a whimbrel, they usually say that's the bird they saw. Most people who sight them aren't usually birders and many do not know shorebirds at all. So, being able to distinguish this bird from a more common one is a problem. And, even experienced birders with great familiarity with this species and whimbrels don't get their sightings accepted partially because of lack of proof and that they may not have adequately ruled out other species to the committee's satisfaction. Fourth, it can be very challenging to photograph and spot shorebirds, even one that has been historically said to be "friendly" and easy to approach. Shorebirds often like to feed far out in mud-flats that are difficult to get to if one can get to them at all. Even people with good scopes and good camera lenses have a hard time photographing many birds. If these birds are mingling with hundreds of other birds far from any accessible point, it is nearly impossible to get a photo. Back when these birds fed on locusts, they could be seen following tractors like egrets did and were fairly common around farms. But, those foods are gone, so they had to adapt to other means of feeding themselves. Here is a list of the differences between Eskimo curlews and their very close cousins, the whimbrel and little curlew of the Old World. Though little curlews are extremely rare in North America (except in western Alaska), they and the whimbrels must be ruled out conclusively before any sighting will be taken seriously. 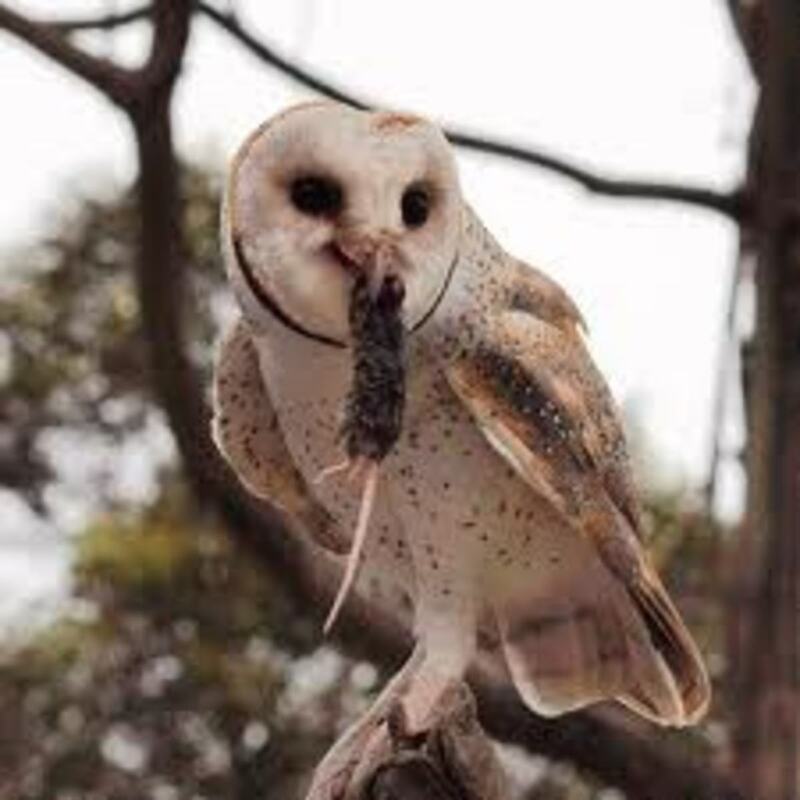 For examples of the only known surviving photos ever taken of this species, please see here and here The un-cropped photos on the second site really give you an idea as to the actual size of the bird. Notice the photo with the person in the background. There was one other photo taken a year before these, but its whereabouts is unknown. 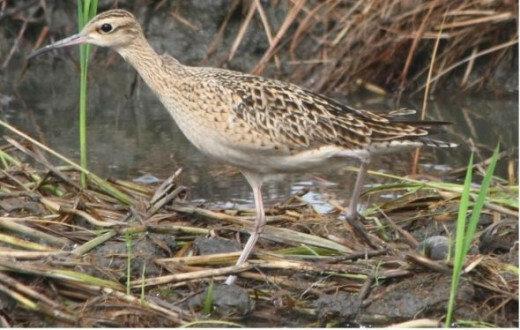 There are no other known photos of this bird unless the one spotted and photographed in Barbados in 2012 is confirmed to be an Eskimo Curlew. Eskimo curlews are small, more like the size of a greater yellowlegs, perhaps a little smaller. Little curlews are slightly smaller and whimbrels are noticeably larger. Most people severely underestimate the small size of the Eskimo curlew. Eskimo curlews have a smaller, thinner bill, about the size of a greater yellowlegs or willet, but curved. Little curlews may have a slightly longer bill, though the difference is not noticeable. Whimbrels have much longer bills. However, juvenile whimbrels can also have shorter bills and be smaller than adult whimbrels. Eskimo curlews tend to have darker legs that are often green or blue-green or grayish-blue. But, a few individuals may have lighter colored legs. They are the only one of the three candidates to possibly have dark brown or green legs. Some Eskimo curlews have a white or pale patch under the chin. Eskimo curlews have a chevron-shaped pattern across their breast and chest rather than barred or streaked like the little curlew or whimbrel. Primary feathers are unbarred in the Eskimo curlew and mostly dark, the little curlew and whimbrel have barred primaries, though sometimes they can look unbarred when wings are folded. Eskimo curlew also have a very pale to rich cinnamon wing linings. The little curlew has a buff underwing and the whimbrel has a gray-rufous underwing. The Eskimo and little curlew are warm brown in color, not cool brown or grayish brown like the whimbrel. The eye stripe on the Eskimo curlew often looks faded, non-distinct. It is very distinct on the little curlew and whimbrel. The crown pattern is also very faded and non-distinct unlike the two others. 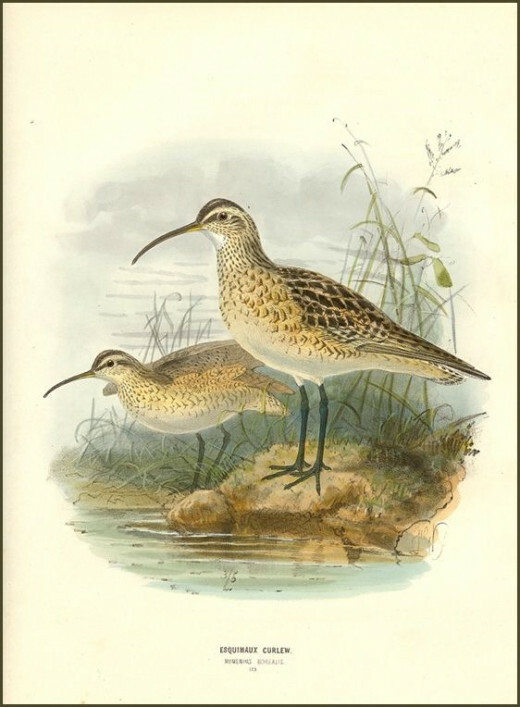 The little curlew has a white (or buff) colored crown stripe and the whimbrel has a very distinct white or light brown crown stripe. The whimbrel has very noticeable, distinct head markings even as a chick. Wingtips of the Eskimo curlew often are as long or longer than the tail when folded, unlike the little curlew and the whimbrel. The Eskimo curlew's feet does not noticeably project past the tail when flying. The little curlew's toes do project slightly. Whimbrels have longer tails, so their toes usually reach the end of their tail in flight. The bellies on the Eskimo curlew are reddish-yellow (rusty) while the little curlew and whimbrel have nearly white or pale buff. Eskimo curlews only have their "buffy" underside while in breeding plumage in the spring and summer. Fall and winter curlews may be less bright and buffy and more easily confused with whimbrels. Photos are critical for identification. 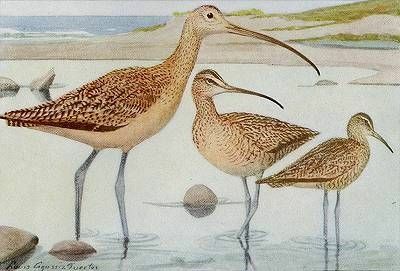 This photo, taken from an encyclopedia of birds published in the early 1900s, shows the three major curlew species together. On the left is the long-billed curlew, the middle is the whimbrel, and the one on the right is the Eskimo curlew. Note the difference in markings and size. I was going to make another slideshow with little curlew (numenius minutus) photos, but the only ones available were labeled wrong. Here is one photo, from Wikimedia commons, of a little curlew that is accurate. The size, shape, and bill length is similar to the Eskimo curlew, which is slightly larger, but the breast is streaked and not chevroned. Also, the head markings are slightly darker. When flying, this bird will have barred primaries. They mostly fly from arctic Russia to Indonesia and Australia and some Pacific islands. 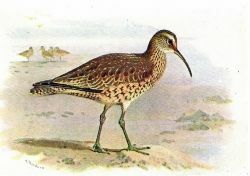 It was once assumed that this bird and the Eskimo curlew were the same species. 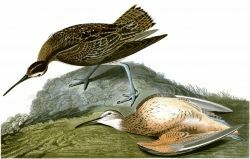 Though no genetic studies, that I know of, have been done, it is now assumed that they are, in fact, two different species or at least two different races of a superspecies of small curlews. Little curlews are occasional vagrants to the west coast of the United States and Canada, where the Eskimo curlew is unlikely to be seen west of the Rockies. Only one west coast record of an Eskimo curlew occurred in San Diego in 1883 in which is was promptly shot and, most likely, eaten. Photo provided to Wikipedia by Wayne Cheng. If you are looking for Eskimo curlews, you will definitely need a good birding scope. Most likely, if they're out there, they will be far out of view from the naked human eye. There is no way around not getting a scope because it's critical to be able to tell the sometimes minute differences between a whimbrel, little curlew, and Eskimo curlew. Binoculars don't cut it, scopes are much clearer. Swarovski is the top of the line in birding scopes. However, there are lower cost options out there. Be sure to read all the reviews and talk to other birders out there before buying your scope. It's extremely important to take photos to document your sightings or get a closer look at a bird later on on your computer. Scopes and cameras can be fit together, however, digiscoping takes a lot of patience and practice. Here is a suggested adapter to use with the scope above. Be sure to research your equipment to see what adapter would best fit your needs before buying. Be sure to check your scope and camera to make sure that this is a good fit. Not all adapters and cameras work on all scopes. Here is a list of where to see these birds at what time of year. Given the small size of the population (assuming they're not extinct). they could be anywhere in their normal migration areas. January-March: These birds are just beginning their migration north from Argentina. They can often be seen reaching the shores of Mexico and Central America at this time. Some have been spotted on the Gulf coast of Texas. Some birds may be still be seen in certain parts of South America. April-June: This is usually the time when most sightings are reported, especially in Texas. But, may also be sighted in states like Arkansas, Oklahoma, Missouri, Kansas and Nebraska. Some birds may be moving up the plains through Canada at this time and a few may reach their breeding grounds on the Northwest Territories. July-September: This would be one of the hardest time of year to spot any. They will most likely be anywhere in the North American arctic circle. Some may be spotted near Labrador or across Ontario. A few might be spotted in Maine and northern New England in the later months. Most sightings this time of year take place on the Atlantic coast of Canada and the United States. October-December: By this time, most of these birds should have migrated away from North America. They may be spotted on various Atlantic islands depending on how bad the storms are in their migration routes. By December, the entire population should be in Argentina. Where to report sightings: Reporting sightings depends on where you live. 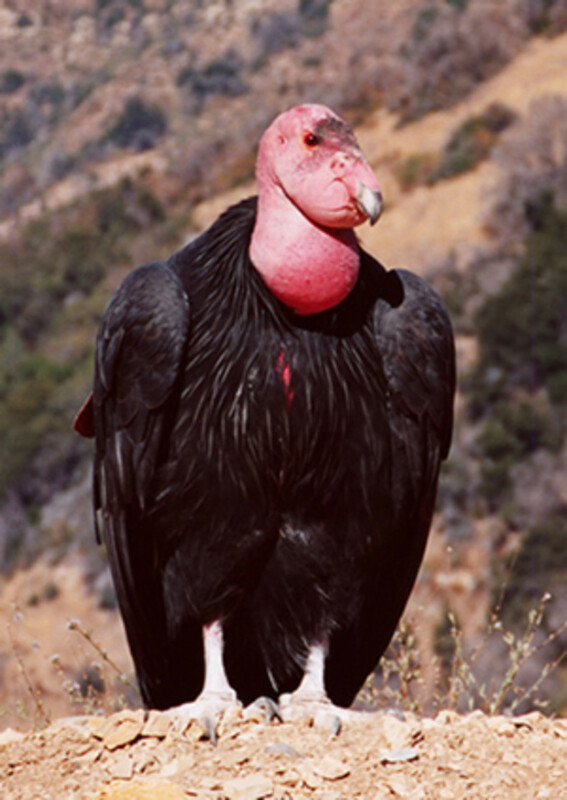 But, most people can report rare birds through the North American Rare Bird Alert website by the email address on the screen. You can also report through fish and game, your local Audubon society, or by contacting a local ornithologist. If you are an eBirder (www.ebird.org) or familiar with that citizen science program, you can report Eskimo curlews by using the "add species" function on the page where you add your sightings. An eBird verifier will get in touch with you through your email address. If you have photos, you can attach them to your sighting record by posting them on Flickr and embedding them into your report. Keep detailed notes on your sightings and when asked, describe all the details you recorded or remember. Remember, your sighting WILL be challenged thoroughly and may even be rejected even with what you consider good evidence. Don't let that discourage you from reporting your sighting. Unusual Eskimo curlew sightings - You never know sometimes. I am beginning to compile a list of Eskimo curlew sightings/captures in unusual areas in the past. Most of them will either be when the Eskimo curlew was still fairly common, while a few will be after the big massacre in the late 1800s. I am mostly listing credible sightings where whimbrels can be ruled out. I am still working on this list. 1870--An Eskimo curlew was spotted for sale in a meat market in Ireland There was no record of any meat shipments from the Americas when this bird was found making the observer suspect that it was shot in the country. 1883--San Diego, CA. An observer shot an Eskimo curlew while hunting whimbrel and long-billed curlews. It's possible that this may have been a little curlew and it is unknown how experienced the hunter was in telling the difference between the two. It is unknown what happened to the specimen. 1906--Atlantic ocean. The crew of a boat heading towards Ireland captured an Eskimo curlew which landed on their boat. One observer noted that it looked like it had eaten fairly recently, despite being far from land. Instead of killing it, the crew captured and fed it for what might have been several days or even weeks. Unfortunately, it did not survive the trip. The crew attributed its death to overeating and lack of exercise. This painting illustrates nicely the buff color and lack of distinctive eye stripe. This photo was taken from Wikimedia commons. Report only what you see, not what you think you're supposed to see. And, most importantly, DO NOT fake sightings. It's a disservice to everyone, especially to people trying to save endangered species. Here are some links to other articles on the Eskimo curlew. Learn basic facts about the curlew and its threats. Did the Eskimo curlew interbreed with other species? There is a theory going around some birding circles that the Eskimo curlew may have started to interbreed with other species when their numbers became low. Eskimo curlews were known to mix with other shorebirds, including whimbrels, who are very similar in both appearance and behavior. 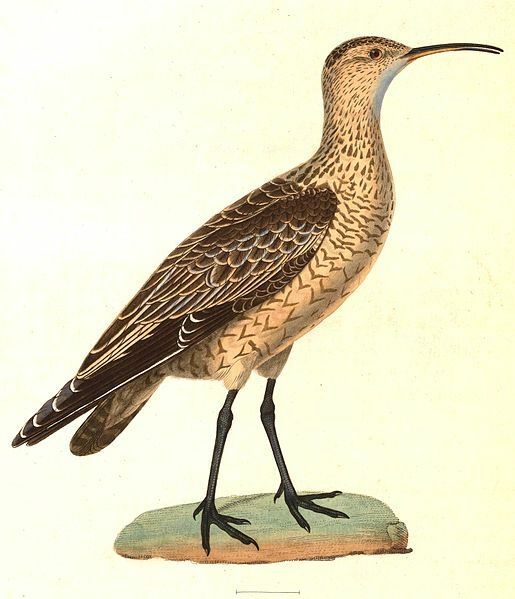 Some have suggested that Eskimo curlews required high numbers in order to breed much in the way the passenger pigeon did. 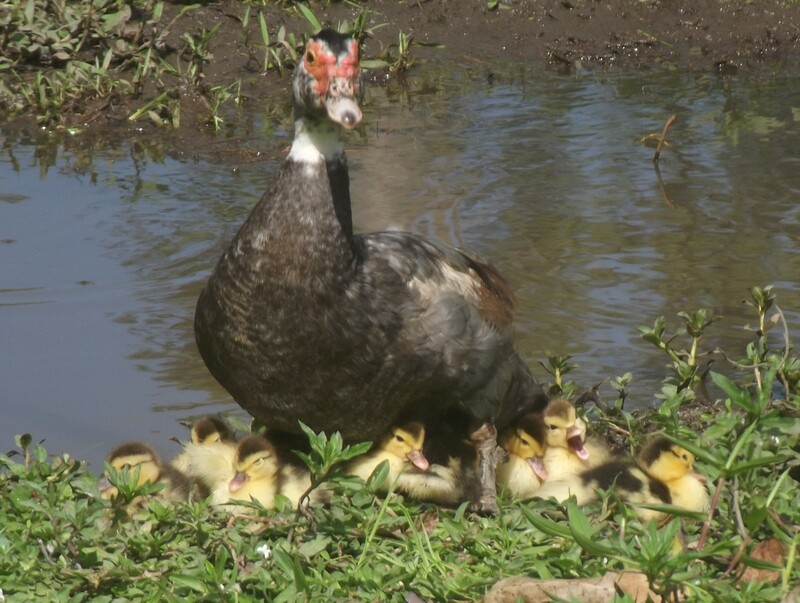 Birds are known to interbred with closely related species and produce offspring. Some offspring could be fertile depending on how closely the species are related. Similar species such as little curlews and whimbrels may be viable candidates for interbreeding, but it is unknown just how closely related they actually were. Another candidate could be the upland sandpiper. If the curlew has been interbreeding with other species, it may explain some recent sightings. 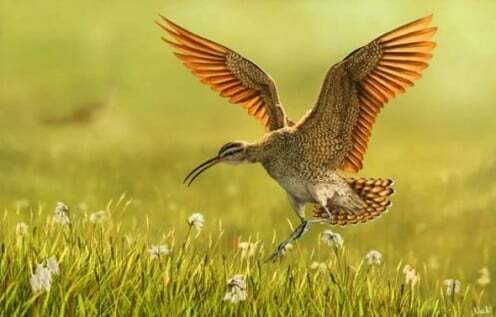 For example, a whimbrel-Eskimo curlew hybrid would share several characteristics of an Eskimo curlew, but flock and travel easily with other whimbrels and common shorebirds. Here are a couple suggestions to help this species if it is, indeed, not extinct. 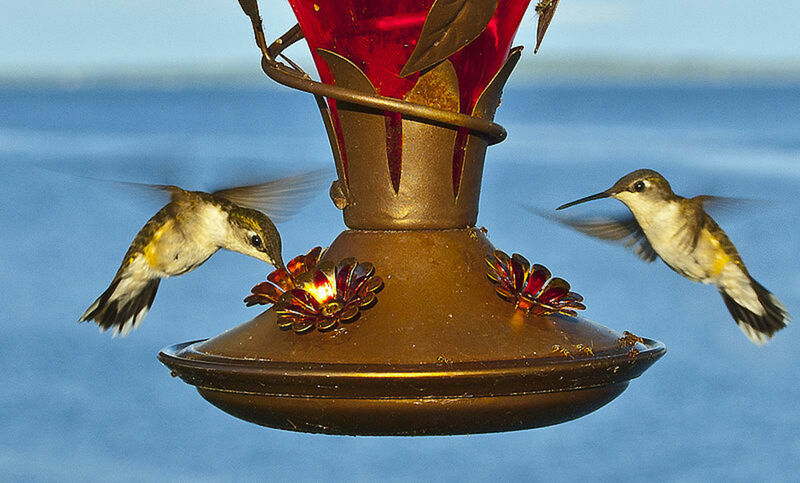 These tips will not only help these birds, if they exist, but many other birds as well. One thing is to be wary when hunting not to kill or disturb these birds. Hunters can be the best chance of finding and reporting these birds as they are often out in areas where they might exist and are good at noticing and tracking different types of game. They are usually the first to notice something unusual in their hunting areas. Another suggestion is to plant crow berries and other berries in climates where they will grow, especially around the east coast and through Ontario and Quebec. The birds use these to fatten up for their extremely long trips during their migrations. Crow berries can be nutritious and tasty for human beings, too! Do You Think the Eskimo Curlew is Exintct? Do you think the Eskimo curlew is extinct? Do you think you've seen any Eskimo curlews? Do you think you could recognize them? Photograph them? What do you think the chances of finding one is? So, have you seen any of these curlews? That sounds very hopeful for this species! I wish I could have been there! On October 3, 1994 on Bolivar Flats, my partner and I spent 20-40 minutes looking at a possible Eskimo Curlew. It stood out from the other waders which included mature and immature long billed curlews and whimbrels, American golden plovers, and others waders. We took detailed notes aud used several field guides. I thought it was a rare sighting but when we flew home to Florida the next day we read more about its status and kicked ourselves for not running back to the van for the camera! We reported it to Rare Bird Alert and were interviewed by Yvonne Sheppard and mentioned in Birders Digest. We cant guarantee it was an Eskimo Curlew, but we know it was not a long-billed curlew or a whimbrel. It stoid out from all the other birds on the beach. We were very close to the birds, used Swift and Celestron binoculars and a Discoverer spotting scope, 3 or 4 field guides and 9+ years of serious birding experience in South Florida, Texas, and a few other states. Another similar sighting was reported on High Island, TX the following year in the last week of September. It makes sense to us that surviving Eskimo Curlews may not follow the historical migration routes. I am glad we didnt know much about the Eskimo Curlew or we might have discounted it and not given the bird the time and attention it deserved. We should all keep open minds while birding so we don't miss a rare visitor! I didn't see that PBS special! I've been waiting for it to air, but haven't seen it. I did a review hub of the Last of the Curlews. My hub has 2 of the 5 parts of the TV show from the 70s on it. You can find the other parts on YouTube. Also, I think there's one YouTube posting of the entire thing. Too bad the ending song was cut off. I just saw a documentary on PBS - The Passenger Pigeon; Flight to Extinction - to mark the 100th anniversary of just that on Sept. 1 , 2014. In the documentary some scientists are now taking DNA from extinct birds and modifying DNA from close species to "de-extinct" them. I hope they will do the same for the Eskimo curlew. I saw "Last Flight of the Curlew" as a boy in the 70's and to this day it still breaks my heart. Somebody bring them back. It is so sad that much of our wildlife are becoming extinct. I would love to hear of a confirmed spotting of one of these birds. PS - that painting is amazing - it looks so much like an actual photograph. Nice lens. I've never heard of this specie before, but they are so elegant in the photos. I hope they have survived. @choosehappy: Yes, I have it on my wall right now. The prices at Deviantart, where Nachiii sells them, are very reasonable. I did have to buy an odd-sized frame, though. But, it looks great on my wall. It would be awesome to see one, maybe Steve Kaye will shoot one with his camera for us someday. I haven't seen them, but that painting is absolutely beautiful up there! I don't consider myself a birder, and no I probably wouldn't recognize one when i see them. I do find it disappointing that one person shot the bird in two separate occasions! Fascinating mystery... I wonder if these birds still exist! @MBurgess: That is probably a long-billed curlew, a larger relative of the Eskimo curlew. Shame on anyone who hunts them because they are illegal to hunt. They, too, are declining. They're more plentiful out west. There is a type of curlew that lives in Florida. It is about the size of a stork. They call them flying deer.... Rumor has it the meat tastes like venison and that is part of why they are endangered. I believe birds of all specials (except maybe pigeons) are becoming endangered because we are invading and changing their habitats. It's a shame so many beautiful species have been harmed because of "progress". Great lens! You have some incredible lenses. I actually learned a thing or two (or three). Fantastic. I wish I could find one because that would mean they're still there. You must know a lot about birds to create such a well-informed article. Thank you for publishing this. It about an important topic. So sad when any species goes extinct. Nicely done. Hope there are still a couple somewhere. I hope I'll be lucky to see one. Why is it so difficult to find an Eskimo curlew? Why, because they are vacationing in sunny Florida ... in my backyard ... I do honestly believe!!! !